Naturally helps discomfort when your body produces too little of the enzymes needed to digest the foods you eat. Typical effects from food intolerance: Minor abdominal cramps, occasional fatigue, nausea, occasional gastrointestinal effects. 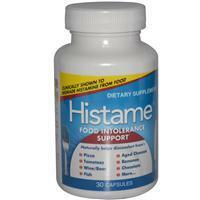 For adults, take one (1) or (2) capsules within 15 minutes of consuming products causing food intolerance. Maltodextrin, hypromellose, rice hull powder. Contains <2% of: magnesium stearate, gellan gum, silicon dioxide, water, sodium chloride. Do not take if you have immune system based food allergies. If pregnant, nursing, on medication, or with known medical condition, consult your physician before use.